As promised, I’m releasing OmniThreadLibrary with 64-bit support today! Get it now: ZIP, SVN, UML diagrams (provided by Rich Shealer). If you’ll be using it in production, wait until Tuesday as I won’t be fixing any bugs over the weekend and on the Monday there is a public holiday here in Slovenia. OmniThreadLibrary 3.0 beta is available for download. Please test and report any problems. Version 3.0 will be officially released on Friday. For quite some time, thread pool in OmniThreadLibrary had a weird problem – if you scheduled more than 80 tasks in one go, FastMM would report memory leaks when application was terminated. It bothered me, of course, but I could never find the real reason behind the problem. And so I left the code “as is” and said to myself that nobody would encounter it in practice, anyway. And then Žarko came and wrote about me on his blog :( In case you are living in a dark cave and didn’t hear of him – Žarko runs immensely popular Delphi site at About.com. His testing (and most of all his highly reproducible test case) gave me a new energy to pursue the problem. It is my pleasure to announce the availability of OmniThreadLibrary 3.0 beta. The main focus of this release is on the 64-bit support. Every part of OmniThreadLibrary is now compatible with the Windows 64-bit platform! The current status of the code is “It works on my machine”. That is not pretty encouraging and I would really like to see some external testing. If you are using OTL, please get the fresh copy from the SVN and check if your applications are still working. 64-bit bugs are not a big problem right now – they will be squashed before any 64-bit OTL code goes into production – but I’d really like not to break existing code. Thanks! Thread pool is working, other tests are passing nicely and it looks like you’ll be able to get your hands on the alpha version tomorrow. Second milestone reached – dynamic lock-free queue works in 64 bits as does blocking collection. The latter is basis for most high-level threading abstractions in the OmniThreadLibrary so this is quite an important milestone. Thread pool was not tested yet so the code is still in “look but don’t touch state”. “Bounded” containers (fixed-size stack and queue) are now working fine both in 32- and 64- bits! This is quite an important step because those containers are used to transfer data between OTL controllers and threads (i.e. they are used inside the Comm mechanism). They also contained quite some assembly code. Great thanks to GJ who did all hard work to make x64 OTL possible! Current status is “Look but don’t use”. Many parts are still broken. As you can see, this is pretty long-winded. If you are initializing an interface, then you’ll usually have written a factory method already and the code would be much simpler (example below this paragraph) but in the case of objects this is not very typical. and use the longer version only when needed, for example to initialize interfaces or to call a non-default object constructor. What could possibly go wrong? In response to my recent article on various kinds of initialization, GJ proposed another algorithm, which I will call here busy-wait initialization. This is the first time I’ve encountered this approach and I have no idea whether it is wide-known and has an “official” name. Yanniel recently posted two ways to generate Fibonacci numbers, here are two more. Of course you need a Fibonacci-implementing enumerator. I wrote one on 2007 and it uses the iterative approach. Read more in my old article Fun with enumerators, part 6 – generators. This one was prepared for ITDevCon 2011 as an example of tricky (but pretty much useless) example of what can be done using anonymous methods. I was always holding the opinion that locks should be as granular as possible. Putting many small locks around many unrelated pieces of code is better then using one giant lock for everything. OmniThreadLibrary includes (in the OtlSync unit) a neat record called TOmniCS which wraps IOmniCriticalSection interface (which in itself is just a wrapper around the TCriticalSection) and allows you to use it without an explicit initialization. You just declare a variable of the TOmniCS type in your code and then call Acquire and Release methods of this variable and everything is handled for you. As records don’t provide automatic initialization via parameterless constructor, the code is slightly tricky. The record contains a field (ocsSync) that contains the interface reference used to do real work. This interface is initialized in the Initialize method, which is in turn called from the Acquire and Release. Eh. How true. :( Care to step in? It’s really simple. Take a sample application (for example 37_ParallelJoin), check what it’s doing and convert it into a unit test. [In this example, first button should cause a wait of about 3 sec and second button should cause a wait of about 5 sec. That’s all.] If the application you have chosen seems too complicated to be converted to a unit test, just ignore it and select another. Why? Because I’ll be converting OmniThreadLibrary to support 64-bit and FireMonkey in the next week and I really could use a safety net which would ensure at least that I don’t break everything at once. Why you? Because I’ll be converting OmniThreadLibrary to … but I already said that. If you can spend some time on that, then I don’t have to and everything will be finished quicker. If you like OmniThreadLibrary but don’t feel competent enough to help developing it, this is your chance to step in and help the development effort! Today’s question was asked by Žarko Gajić, the excellent maintainer of About.com’s Delphi section. input: a string. output: a TStringList containing characters (one per entry) of the input string. A background thread ("master") grabs the input string and splits it into several pieces (let's say 2): "del" and "phi". For each of the split strings a new thread ("child") is created that fills in the TStringList (output) with characters from the section of the string it receives. At any time the "master" thread could be signaled to terminate (from the app's main thread) all child threads (and itself). When everything is done the app's main thread processes the string list. Preferably, the order of the characters should (when all ends) be 'd', 'e', 'l', 'p', 'h', 'i' (note that characters are actually items in the resulting string list). FastMM is a wonderful memory manager, but it can slow down quite a lot when used in multithreading environment. While Pierre has implemented some conditional defines that could help the multithreaded code, namely NeverSleepOnThreadContention and SwitchToThread, I’m now making a point that you shouldn’t ever use them! Just see for yourself. An interesting problem appeared on StackOverflow shortly ago – how to generate large quantities of data as fast as possible and store it in a file. (As one could expect) I wrote a parallel solution using OmniThreadLibrary, more specifically the Parallel.ForEach high-level primitive. I’m not posting the complete solution here, just the important part – a method that accepts two parameters, requested file size and output stream, and generates the data. Actual initialization of data buffers is delegated to the FillBuffer method which you can see in the StackOverflow post. While the biggest focus on the Pipeline improvement was on the exception handling, there were also some changes in the basic functionality. The most important (and code breaking!) change happened to the Input function, which was renamed to From. If you now want to pass a input queue to a pipeline, use pipeline.From(queue). Second code breaking change happened to the Run function which now returns IOmniPipeline (i.e. the pipeline interface) itself, not the output blocking collection. Luckily, both changes will be caught by the compiler which would not want to compile the old code any more. I have known for a long time that there’s a potential race condition between two writers in TOmniBlockingCollection but I thought that it doesn’t present and clear and present danger. Boy was I wrong! I found Sleep Sort so ingenious (in the mad genius way) that I just had to implement it using the OmniThreadLibrary framework. The code is now shorter than Serg’s original implementation and it’s … wait for it, wait for it … even faster! Twice as fast as the original, actually! Now that I call an improvement! The code below carries not copyright nor copyleft and can be used in any occasion as long as you don’t blame me for getting fired or any other problems in your personal or professional life it may cause. My article on lock-free vs. locking data queues was well-received but there were also some comments and complaints. To answer the critics (your comments were all very appreciated!) and to fix some issues with the previous test I’ve decided to stage a rematch. Both Iztok and Chris have provided me with new versions of their queue implementations. Iztok’s code was tuned a little and changed to use TOmniValue instead of TAnyValue for better comparison with TOmniQueue. Chris has created three different variants of his code. That is, if you are a C++Builder programmer and want to help an open source project. And now a user reported that the OTL doesn’t compile. In C++Builder. And I don’t know how to help him. With his problems. In C++Builder. Is there a nice soul out there that can tell me how to fix the problem? (Or even better, who can make sure that the OmniThreadLibrary compiles with C++ Builder.) Your fixed will be gratefully imported into the main development branch and you’ll earn an eternal fame. During that time I’ve discovered a showstopper bug in TMonitor which practically made TSimpleThreadedQueue useless when using more than one reader. Still, I’m including partial results for that implementation too, as they provide a good comparison. My elation continued while I was coding my test app and while I tested my own queue. And then I plugged in Chris’ queue and … everything went downhill :( Immediately, my test app started crashing. At first it looked like the bug was in Chris’ code, but when I enabled debug DCUs, debugger pointed to a very unlikely location – TMonitor. Unlikely because of two reason – because I know that Delphi people take quality to the heart and test the code and because I know Allen is an experienced guy who writes excellent code. Hierarchical data appears everywhere and most of the time it must be rebuilt from simple non-hierarchical storage. Think about mail, news, CVS repositories and databases, not to mention groupware and chat forums. Trees are everywhere. This article dealt with thread sorting, an algorithm that takes a number of items connected with parent-child relationship and puts them into a tree so that they can be displayed in a nice structured way. The ideas and implementation are still perfectly valid. Links: article (PDF, 82 KB), source code (ZIP, 241 KB). Fork/Join helps you solve just one class of problems, but it is an important one – the problems that can be solved by so-called Divide and Conquer algorithm. For deeper discussion of D&C, read the Wikipedia article linked above. What interests us is that D&C works by subdividing the problem. Instead of trying to solve the big problem, we divide it into many smaller problems and then we try to solve them. Those subproblems may again be too big and have to be subdivided even further. The process continues until the subproblems are small enough that they can be solved easily. Of particular interest to us are D&C algorithms where subproblems can be solved in parallel. High-level OmniThreadLibrary parallelism (i.e. the OtlParallel unit) is great when you are running mostly independent parts of code but what can you do when you want to communicate with the main thread from a task? A few weeks ago my answer would be along the lines of setting communication channel manually or dropping down to low-level parallelism (i.e. the CreateTask) but both are very complicated solutions. There was certainly a room for better solution. Since the release 910, released on April 17th, OtlParallel contains much simpler way to configure tasks and to set them up for communication with the owner. In short, Parallel.Async accepts an anonymous method, normal method or procedure (all of them must be without parameters) and executes it in a background thread. That’s all. My presentation from ADUG 2011 is now online at http://www.thedelphigeek.com/p/presentations.html. Check out the handouts document as it contains lots of my previous writing on OmniThreadLibrary (high-level stuff) neatly collected and organized into one document. This year’s Australia Delphi User Group symposium is a two day event with sessions in Melbourne and Sydney. The first of those – the Melbourne session – happened today. We met in the John Scott Meeting House at the La Trobe university. Turnout was quite big – nearly 80 very attentive listeners. You may know that lifetime ago I developed fairly successful Delphi profiler called GpProfile. You may also know that it kinda slipped into oblivion and that it can’t correctly profile modern Delphi code (it is a source instrumenting profile, i.e. it changes your source code so it can be profiled). You may know all that but I’m fairly sure that you don’t know that GpProfile now works for all Delphis up to XE! How can I be so sure? Because I only learned this a short time ago! Антон Алисов (Anton Alisov) was brave enough to step in, update the code and create the Google code archive. Go Anton! In case you’re still using GpProfile (or just want to find out why it was one of most popular Delphi profilers), visit gpprofile2011 project on Google code. 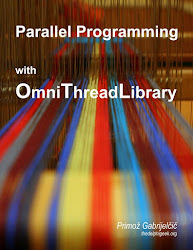 In the previous two installments I’ve tried to give a little insight into how OmniThreadLibrary’s Parallel ForEach is implemented (part 1 – Overview, part 2 – Input). Today I will conclude this short series with the description of output ordering – or what is know in the OTL as the .PreserveOutput modifier. Ordering is usually used together with the .Into modifier. The reason lies in the integration between the Parallel infrastructure and your parallel code (the one that is executing as Parallel.ForEach payload). In the “normal” foreach statement, output from this parallel payload is not defined. You are allowed to do whatever in the foreach, to generate any output (in case you need it) but Parallel will know nothing about that. Therefore, the OTL has no ability to preserver any ordering because – at least from the viewpoint of the library – the parallelized code is producing no output. I’m very excited to announce that OmniThreadLibrary will appear before the Australian public in this year’s ADUG Symposium! This year’s symposium will happen in Melbourne on 24th and in Sydney on 25th of March. The title of my presentation will be “Getting full speed with Delphi?” and will cover multithreading programming and high-level OmniThreadLibrary stuff. In the last few years, the traditional approach to speeding up programs ("We'll just wait for the next generation of hardware.") doesn't work anymore. In this talk, we'll see why Delphi programs use only 12.5 % CPU on a modern machine and what we can do about it. The session will show you how to make murky waters of multithreading accessible to every Delphi developer with the help of open source OmniThreadLibrary. In case you want to meet with me and discuss multithreading programming (or anything else, including life, universe and everything), I’ll be available before the Melbourne and after the Sydney event. In my last post, I’ve presented an overview of classes hiding behind the parallel for implementation. Today I’ll focus on the input part of the parallel for – the part that fetches values the loop is iterating over and passes them to parallel tasks. More specifically, I’ll present source providers, data managers and local queue. Aeons ago I promised to write a blog post about all the magic that happens behind the scenes in Parallel.ForEach. That never happened (sorry). I was busy will other stuff and I had to put it on the backburner. Today is the day to fulfill that promise. This article starts the journey that will (hope, hope) explain the murky waters of parallel loop data management. Three parts are planned – Overview (which you are reading now), Input and Output. Even if you are interested in parallel programming, you may think that such low-level stuff is of no interest to you. Well, you may be right, but let me state three reasons why you should read this three-part series. 1) Because you will then know what the OtlDataManager unit is good for and will be able to use it in your application. A lifetime ago when I was still programming on two 1280 × 1024 monitors I’ve published a post about the IDE layout I was using at that time (in Delphi 2006). I was always saying that there’s only one reason why a programmer should use two monitors – because (s)he has no place for the third one! So when the opportunity knocked I did the same – cleaned up some place on the desk and installed a 1920 × 1200 monitor in the middle. GpLists 1.49: Implemented TGpGUIDList, a TGUID list. GpStructuredStorage 2.0c: Uses GpStreams instead of (deprecated) GpMemStr. Erik Berry fixed GpTextStream and GpLists to compile with Delphi 6; those changes were committed to SVN only.